These oven-fried fish fillets are an excellent alternative to deep-fried fish. A combination of seasoned bread crumbs, Parmesan cheese, and panko breadcrumbs make these fish fillets crunchy and flavorful. Serve with baked or deep-fried French fries and coleslaw for a delicious family meal. Use the included quick tartar sauce recipe or serve it with this spicy Louisiana remoulade sauce or cocktail sauce. Line a rimmed baking sheet with foil and then oil or spray the foil with nonstick cooking spray. In a medium bowl, beat the milk or cream with the egg. In another bowl, combine the panko crumbs, seasoned breadcrumbs, and Parmesan cheese. Dredge the fish fillets in the milk and egg mixture and then coat thoroughly with the crumb mixture. Arrange on the prepared baking sheet and sprinkle lightly with salt and pepper. Bake for 12 to 20 minutes, or until fish flakes easily with a fork. Check thin fillets for doneness at about 10 minutes. 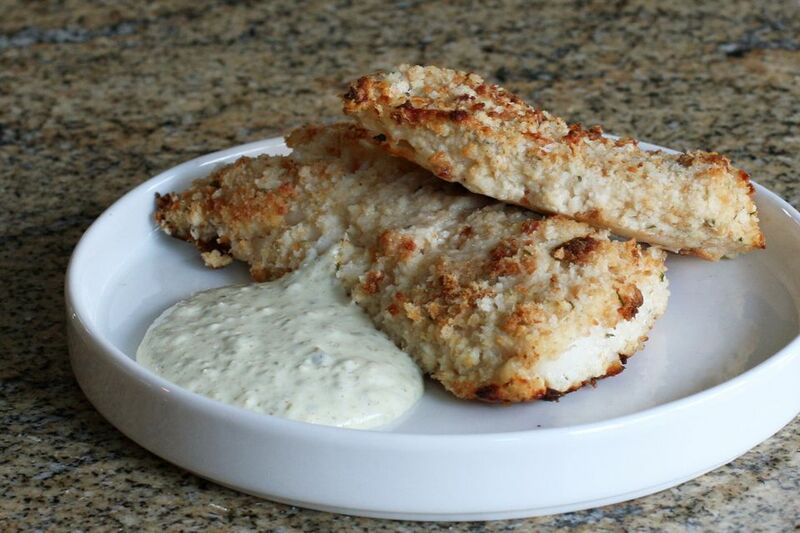 Serve the fish fillets with the quick tartar sauce (below) or your family's favorite homemade or commercial sauce. Add french fries and coleslaw for a perfect meal. In a small bowl, combine the mayonnaise, lemon juice, relish, and onion powder. Mix to blend thoroughly. Serve with the oven-fried fish fillets. The thickness of a fish fillet determines the cooking time. To test fish for doneness, insert the tines of a fork into the center of the thickest part of a fish fillet. Twist gently. The fish should be opaque in the center and will flake easily. Haddock and other fish fillets often have a "tail" which is thinner than the rest of the fillet. Tuck thin ends like this under so the thickness of the fillet is uniform. Add dried parsley flakes to the crumb mixture.